Sorokina M., Rude А. 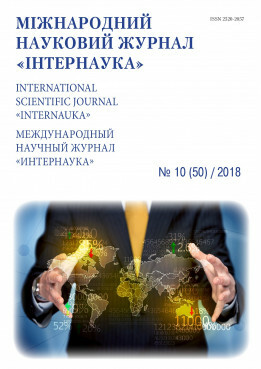 Application of interactive internet tools for developing students’ professional communication skills at teaching English // International scientific journal "Internauka". — 2018. — №10. State Higher Educational Institution "Pryazovskyi State Technical University"
Summary. The authors of the article suggest method of using several Internet resources at the English class with the aim to develop communicative skills among students. Rey words: Internet-tools, communicative skills, methods of teaching, foreign language. Анотація. Автори цієї статті пропонують методику використання засобів мережі Internet на заняттях з англійської мови з метою розвитку навичок професійного спілкування студентів. У статті розглянуто декілька етапів, кожен з яких відповідає якісному рівню освоєння комунікативних навичок при вивченні іноземної мови. Ключові слова: інтернет-інструменти, комунікативні навички, методика викладання, іноземна мова. Аннотация. Авторы данной статьи предлагают методику использования средств сети Internet на занятиях по английскому языку в целях развития навыков профессионального общения студентов. В статье рассмотрены несколько этапов, каждый из которых соответствует качественному уровню освоения коммуникативных навыков при изучении иностранного языка. Ключевые слова: интернет-инструменты, коммуникативные навыки, методика преподавания, иностранный язык. Nowadays Internet network is but a public, universal medium of communication, as well as means for circulation of electronic mass media, a medium for business data exchange and advertising. Internet users invent every single day new ways of using the net, bearing in their mind different objectives, including educational ones. Services developed previously are giving way to new, more perfect, convenient and practical ones . Consequently, the set of these services, extends users’ communicative opportunities, bringing them, closer and closer to direct communication. The number of network’s users grows with each day, embracing new countries, ensuring access to internet for their residents. The network appeared first in the USA. That is why the subscribers had to use English, as the software had been developed in the English language. Latest software allows to apply the mother tongue. So, Internet is becoming an extremely accessible and universal medium for international communication. That why application of this medium for developing and improving the skills of oral and written communication between students and native language speakers seems to be very promising. Moreover, application of internet resources can help to improve formation of students’ language and professional competence and raise students’ motivation in learning a foreign language as means of their professional communication, facilitating their research and analytical work in such programs like Microsoft Word, Power Point, Movie Maker and the like. Application of webinars and blogs can play some special part at that. Webinar is capable of being compatible with many organization forms and methods of teaching. Still, its participants need some time to develop special skills for working in webinar mode. Webinar is used for delivering lectures with feedback, thematic seminars, group work, presentation of various products, including commercial and engineering . students can participate in discussion of recordings, prepare tasks on their basis and solve them jointly. Blogs promote students’ involvement in active interaction with each other and their teacher. Students are taught to express their thoughts (questions and answers) in a written form as comments. It is known that direct communication can’t be replaced by other means for teaching foreign languages. Language laboratories, up-to-date computer software, interactive teaching systems, cannot fully compensate direct, first-hand communication. The objective of this article is to describe communicative means and ways of their application that are accessible due to Internet. A student passes several stages in the process of learning a foreign language. At each stage his/her attempts to communicate with native language speakers is characterized by certain difficulties. The task of specifying of ways and means of communication through Internet can be reduced to selection of a service, which on the one hand allows carrying out the communication process on the basis of knowledge and skills, that a student has already, stimulating, on the other hand, his/her aspiration for continuation of such communication. E-mail systems and news systems, based on that technology (USENET), lists of delivery, forums etc. Systems of exchange of text messages in the constant mode (online mode). Talk program, typical for UNIX systems, IRC system, more modern communicative services ICQ, AOL Instant Messenger, numerous Web-chat systems can be described as belonging to such systems. Systems of exchange of audio and video data (VocalTechIPhone, Microsoft NetMeeting, Mediasoft WebRing and many others). All these systems seem have immense popularity. They are widely used and are unlikely to lose their significance in the foreseeable future. Moreover and that is of vital importance all these systems possess means of searching interlocutors on the basis of mutual interests. All systems include multi-language support, they are very easy to use and do not need exuberant resources of computer engineering. It could be wise to subdivide their application for teaching a foreign language into three stages, each of them corresponding to the qualitative level of mastering communicative skills. The first stage: Obtaining basic communicative skills. Original level: basic vocabulary, ability of using a dictionary and teaching literature. Application of USENET means and e-mail is recommended. For such services a big delay period in “question-answer-question” is typical, it providing a student with an opportunity to use a dictionary, a textbook or to consult a teacher. The objective of this stage is to reach an ability to conduct a written dialogue, to enlarge vocabulary, including contemporary speech patterns and neologisms, that are missing in available dictionaries. Original search of correspondents for such communication can be carried out through USENET conferences, possibly via the basic subject of TV-conference, specified by the teacher, proceeding from the consideration of necessity to enlarge student’s vocabulary, required for his/her speciality. Then, it is recommended to pass to direct communication via e-mail, as it will extend the scope of addressees. Second stage: Intensification of communicative skills. Original level: an ability to maintain a postal dialogue, without teacher’s help with minimal number of addressing to textbooks. It is recommended to use the means of exchange of text information on line. When such means are used the time of waiting is reduced to minutes, or even seconds and approaches to normal speech mode. Some additional graphic means (the so-called “smiles”/”emotions”) allow adding some emotion to the conversation and enliven the combination. Application of dictionaries and textbooks is hardly applicable here and is not at all appreciated by interlocutors. Special attention should be paid to participation in the so-called “chats” (English origin), where it is possible to intensify communication, as it is possible to maintain the conversation simultaneously with some interlocutors. The objective of this stage is improving the skills until the level allowing maintaining a dialogue in “on line” mode is reached. The third stage: Practical application of the communication skills at maintaining an oral dialogue. Original level- successful realization of the tasks of the previous stage. Application of various facilities (sound cards, microphone, acoustic systems, headphones, possibly video cards or video cameras) and corresponding software means, like Microsoft NetMeeting, VocalTech Iphone, MediaSoft WebRing, programs, allowing transmitting voice messages via Internet. Besides, there are additional requirements for the quality of the network access channel, its carrying capacity must be at least 19,200 bit/set, without video connection and 38,400 bit/sec when video is used. The software, mentioned above allows maintaining both individual voice talks between interlocutors (it is very important for learning foreign languages) and setting up voice conference communication with participation of more than two persons. The objective of this stage- is realization of the existing communicative skills at the speech level. As practice shows that at this stage it is especially important to overcome a psychological hurdle, appearing at transition of keyboard typing to oral speech. Experience testifies that this hurdle is largely due to realization of the fact that the student is talking in foreign language to a native speaker. The fear of “being misunderstood” or “being incorrect” in expressing his/her thoughts leads to a certain complex. Such complex is similar to the one, that students acquire in a lecture room at foreign language class, where it is caused by the fear of being criticized or getting a bad mark. So, teachers are recommended to plan their lecture room classes with students either preventing or avoiding appearance of that complex. It should be mentioned here that participants in Internet communication are generally kind and positive people and in most cases they help their interlocutors overcome that psychological communication hurdle. Now, let us analyze advantages, drawbacks and separate aspects of realization of such method. As pedagogic practice witnesses that the biggest problems of teaching communication in. It is still problematic for young people of Ukraine to teach a foreign language applying the method of immersion into the language medium and contacts with native speakers are difficult, especially for peripheral language institutions. In our days of wide scientific, technical and cultural information exchange it drastically reduces the quality of training of specialists. At the state level it leads to obstacles on the way to integration of the country into such international structures like EEC and NATO. For an individual specialist it essentially undermines opportunities of successful participating in the international market of intellectual labour and efficient business conducting. At the level of higher education institutions it hampers cooperation with foreign partners. Internet allows compensating to a sufficient extent the absence of natural communication medium. Reduction of Internet providers’ tariffs confirms the assumption that such application of the network is economically beneficial, both for higher education institutions and students. For practical realization of this it is necessary. Creation of specialized computer classes, at higher education institution, equipped with the corresponding software and hardware and having an access to Internet. The system of informing students of an opportunity and methods of using the network for improving their communicative skills, possibly within the framework of a foreign language course. The system of encouraging the students, who make an active use of the network for these purposes, development of the methods of evaluating students’ knowledge with due regard to the quality of communicative skills. Within the framework of technical possibilities of Priazovskyi State Technical University SHEI (PSTU SHEI) there are opportunities of applying this approach at the levels of the first and the second stages. Conducting an experimental course with application of these methods seems to be highly advisable. It should be added to all aforesaid that for application of the Internet with the purposes of teaching a teacher is to determine the advisability of its application, i.e. for reaching of what purposes and solving of what problems this or that resource is to be used. Educational Web-resources can be used in many types of teaching activities: application of authentic Web-resources in the context of the corresponding subject of the lesson, students independent work aimed at searching the required information within the framework of the specified subject. The possibilities of teaching Internet resources are revealed in profile training and elective courses, when foreign language communicative skills, rather than language proficiency play a leading part in the process of studying. Application of new information technologies in the process of teaching allows for a teacher realizing his/her creative pedagogic ideas, exchanging experience with colleagues and getting prompt response and for students it is an opportunity of choosing an individual learning plan, the system of training tasks, with regard to their language proficiency, and also means of correcting and controlling knowledge. Thus, the main requirement of contemporary education is realized – creation of an individual style of activity, the culture of self-determination and stimulating of personal development in the objects of educational process. It may be concluded that application of Internet network enlarges the spectrum of real communicative situations, improves students’ motivation and allows efficient application of the gained knowledge, formed skills, speech abilities for solving communicative problems. The vitality and practical necessity of Internet application for foreign language learning seems to be evident enough, due to the tasks that the program of modernization of higher education is facing. Кузьмина Л. Г. New challenges in writing: Пособие по развитию культуры письменной речи / Л. Г. Кузьмина. – М. : «Еврошкола», 1998. – 46 с.
Попова Т. П. Коммуникативно-ориентированный контроль и самоконтроль на начальном этапе обучения иностранному языку в языковом вузе / Т. П. Попова // Testing and Assessment. Proceedi ngs of the Second International Conference, Nizhny Novgorod, 2002. – С. 57-60. Boeckner Keith. Oxford English for Computing / Keith Boeckner, P. Charles Brown. – Oxford : Oxford University Press, 1993. – 212 p.
Byrne D. Teaching Writing Skills. (Longman Handbooks for Language Teachers Series) / Donn Byrne. – London; New York: Longman, 1988. – 154 p.
Parrott M. Tasks for Language Teachers / M. Parrott. – Cambridge University Press, 1993. – 321 р.